TAOISEACH Leo Varadkar is meeting this morning with the Italian Prime Minister Giuseppe Conte on the final day of his Brexit offensive around Europe. The pair are to discuss Brexit, migration, European budget and trade. 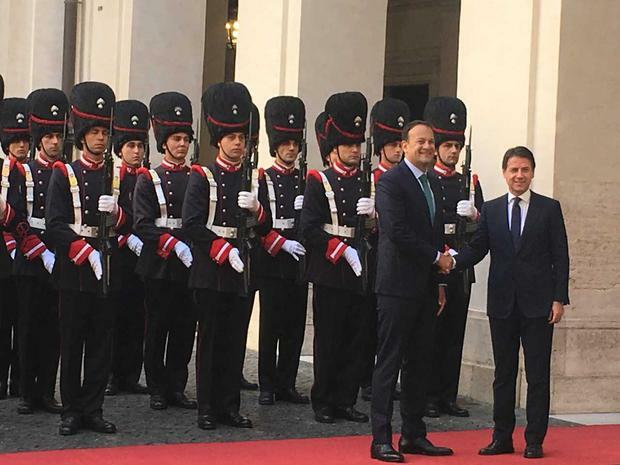 Arriving at the Palazzo Chigi this morning the Taoiseach was greeted by a rendition of Amhrán na bhFiann performed by the Granatieri de Sardegna. Today marks the third meeting with EU leaders this week as Mr Varadkar seeks to keep Irish interests foremost in the minds of his European counterparts as Brexit negotiations continue. Earlier this week Mr Varadkar visited both Croatia and Romania. UK ministers are also on a similar offensive around Europe and today UK business minister Greg Clark is in Rome to meet with politicians and business leaders to promote the vision for Britain’s exit from the EU laid out in the Chequers White Paper.